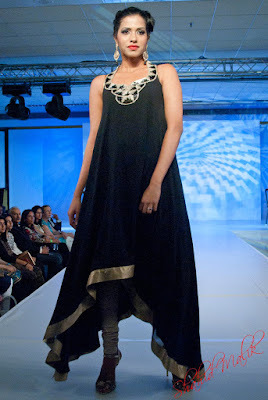 Zooni was another one of the designers on the catwalk at the Ardhanginni Indian Wedding Show 2011. Now considering this was an "Indian Wedding" exhibition which took place in the UK, you'd expect to see indian bridalwear and formalwear. I'm not liking either of these purple dresses, they both look a little bit shapeless to me. As for this dress...perhaps it's an unfortunate camera angle?! I've had a little browse on the Zooni website and surprisingly they do actually have an indian bridal collection, so I'm not sure why they decided to showcase these dresses instead! For anybody that's interested, online retail website IndianHanger.com sells Zooni dresses, click here to view.